We’ll let the publishers describe this one: “All of the grownups in Tib’s prehistoric tribe know that the dinosaurs disappeared ages ago. So of course they don’t believe that Tib has made friends with one. But Tumtum the dinosaur is very clever at hiding from grownups. 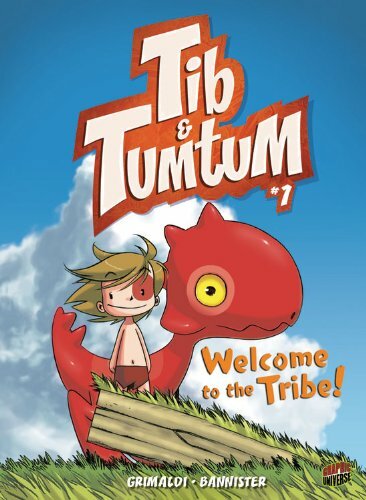 When the friendly red dino saves the tribe’s kids from a pack of hungry wolves while the startled adults look on, the shaman decides that perhaps it’s time to welcome a dinosaur into the tribe.” Tib & Tumtum Volume 1: Welcome to the Tribe! is written by Grimaldi and illustrated by Bannister. This full-color paperback graphic novel is coming out next month from Graphic Universe, but you can pre-order it at Amazon right now.